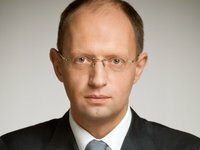 Ukrainian Prime Minister Arseniy Yatseniuk has announced his proposals to a future parliamentary coalition regarding the composition of the new government. In particular, at a press conference in Kyiv on Friday, he proposed appointing Volodymyr Hroisman (the Bloc of Petro Poroshenko) as deputy prime minister for regional policy, Ivan Miroshnichenko (Samopomich Union) as deputy prime minister for agriculture, and Ihor Zhdanov (Batkivschyna) as deputy prime minister for humanitarian issues. Yatseniuk proposed that incumbent Deputy Finance Minister Vitaliy Lisovenko be appointed finance minister and that Deputy Head of Ukraine's Presidential Administration Dmitry Shymkiv be appointed economy minister. He said that it would be expedient to leave Pavlo Petrenko as justice minister, Arsen Avakov as interior minister, Serhiy Kvit as education and science minister, and Yevhen Nyschuk as culture minister. In addition, the prime minister wants incumbent Acting Health Minister Vasyl Lazoryshynets to be approved as health minister. He also asked the coalition to delegate Leonid Kozachenko to the government as agriculture minister and appoint Naftogaz Ukrainy CEO Andriy Kobolev as energy minister. Hanna Hopko (Samopomich) was offered for the post of environment minister, well-known swimmer Denys Sylantiev (Oleh Liashko's Radical Party) for the post of sports minister, and Pavlo Rozenko (the Bloc of Petro Poroshenko) for the post of social policy minister. Yatseniuk also proposed introducing the post of deputy prime minister for European integration in the new Cabinet of Ministers. "I think it is necessary to invite one of the European leaders to this post, but I will announce the final decision after the negotiations are over.... [This should be one of] the leaders who brought European countries to membership of the EU," Yatseniuk said. Speaking about candidates who, in accordance with the Constitution of Ukraine, are nominated by the president - the defense and foreign ministers, he said: "As leader of a political party, I want to state that we are ready to support the candidacies of the Ukrainian president, namely incumbent Defense Minister Stepan Poltorak and Foreign Minister Pavlo Klimkin. They will have our full support." However, Yatseniuk made no proposals regarding nominees for the posts of first deputy prime minister (the post has been vacant since Vitaliy Yarema's appointment as prosecutor general) and minister of the Cabinet of Ministers. Yatseniuk proposed that the coalition decide on a candidate for the post of infrastructure minister (the Infrastructure Ministry is currently headed by Maksym Burbak).